Every home has a handful of Elastoplast plasters, each specifically designed for an individual need, be it for burns, sensitive skin or for little princes and princesses. Recently, Elastoplast have caught the eye of a new demographic: teenage fans of rap artist Elliot Gleave, better known by the pseudonym ‘Example’, who performed on numerous stages over the summer such as V festival, Wakestock, Creamfields, Beach Break Live, Rockness and the acclaimed Glastonbury. To celebrate his recent No 1. Album, ‘Playing In Shadows’, Elastoplast has created 150 limited edition boxes of plasters which adorn the lyrics “Stick around yeah, like Elastoplast”, taken from Example’s chart topping song ‘Stay Awake’. The track is from the rapper’s third album. following ‘Won’t Go Quietly’ and his first album ‘What We Made’, released in 2007. To be in with a chance of winning an exclusive box click here. To listen to Example’s track ‘Stay Awake’ click here. To view Example’s tour dates click here. This video shows some of the stereotypes that society uses to define a women, a man, and the differences between them. How do you think these behaviours became stereotypical? Through Advertising and Media Industries of course. To a great extent, advertising tell us who we are and who we should be, how we should act. It tells us just as did it 10 and 20 and 30 years ago that what’s most important about women is how we look. The first thing the advertisers do is surround us with the image of ideal female beauty so we all learn how important it is for a women to be beautiful and exactly what it takes. Jean Kilbourne continues her groundbreaking analysis of advertising’s depiction of women in this most recent update of her pioneering Killing Us Softly series. In fascinating detail, Kilbourne decodes an array of print and television advertisements to reveal a pattern of disturbing and destructive gender stereotypes. Her analysis challenges us to consider the relationship between advertising and broader issues of culture, identity, sexism, and gender violence, and makes us realise just how dangerous the repercussions are on young women being forced to aspire to be these impossibly beautiful thin rich successful non-existent women. It also highlights the danger of advertising is on men’s perceptions of women: they start to objectify women and believe they are not really human. This was an assignment of ours for our Web Communication module in which we had to compare two websites and comment on their presentation, content, ease of navigation, style, use of white space, SEO, usability etc. 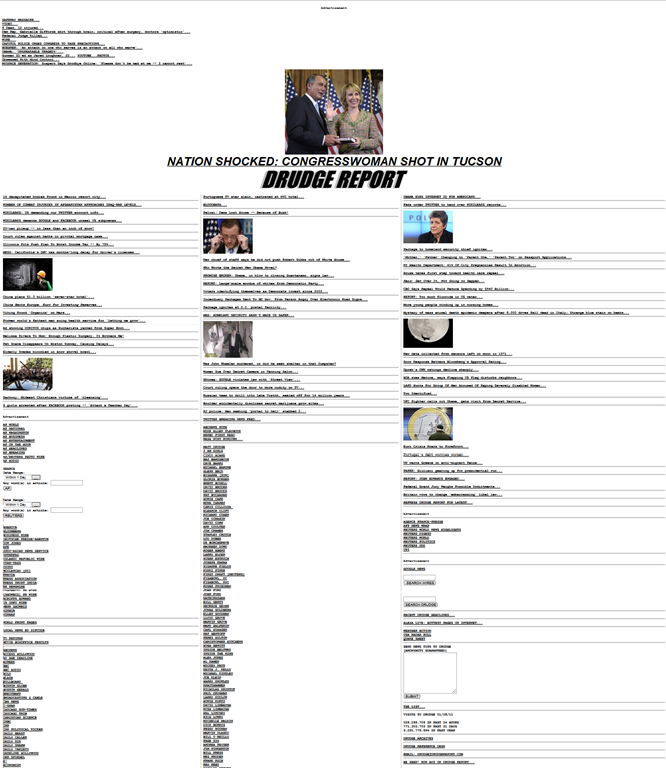 I chose to compare two political websites: The Huffington Post and The Drudge Report. With the internet having nearly two billion users, all intelligent news companies now provide online material for their readers. Politics has now turned to the internet for the distribution of its current affairs. According to the polls for December 2010 on Ebizma.com, The Huffington Post’s website has been ranked as the most popular political news website, with an estimated unique monthly visitor count of 28,000,000. The Drudge Report has been voted second, gaining just half the amount of estimated unique monthly users compared to its rival. Upon comparing the two websites, it is immediately clear why The Huffington Post triumphs. Firstly, the content on the websites differ. The Drudge Report is just a political website so the main page is filled with solely political related content. The Huffington Post reaches a broader audience by catering for other topics aside from politics. These topics have been put in a clear signature teal menu at the top of the page, along with the other essentials such as the website title (also teal), breaking news bar, date, tag line, social networking services, biggest story, and search tab, making “prominent, local navigation: Place your items at the top of the site. The visitors are in a hurry – don’t make them hunt for information” (Spritz Web Solutions).The topics are also organised down the main page through the use of colour co-ordination: a different colour scheme has been applied to each category and when clicked on, a sub category appears to help break down the topic, making navigation easier. They also help organisation by using a ‘quick read’ feature, where a post will come up in an extra box within the window, to prevent the reader from getting lost. The Drudge Report opposes ‘The King of Usability’ Jakob Nielson’s suggestions for navigation. He said “provide navigational aids consistently” (Useit). The site lacks a menu so there are no categories or sub categories, the only essential part it shows at the top of the page is the title and the biggest story and the search tab can be found buried in the middle of the page. These factors make it difficult to navigate around the site, which is why the Huffington Post is superior. The presentation of the site content also differs. The sites match each other in that they both have the main body of their sites split into three columns. However The Huffington Post have organised their columns and kept the layout consistent through the whole site. The Drudge Report’s site is very sporadic by just having its posts spread over all three columns, in no obvious organised formation. There are no subheadings for the columns or sections either, making it extremely hard for the reader to make sense of it all. Both sites have similarities and differences, but it is clear they have been voted the top two for very different reasons. 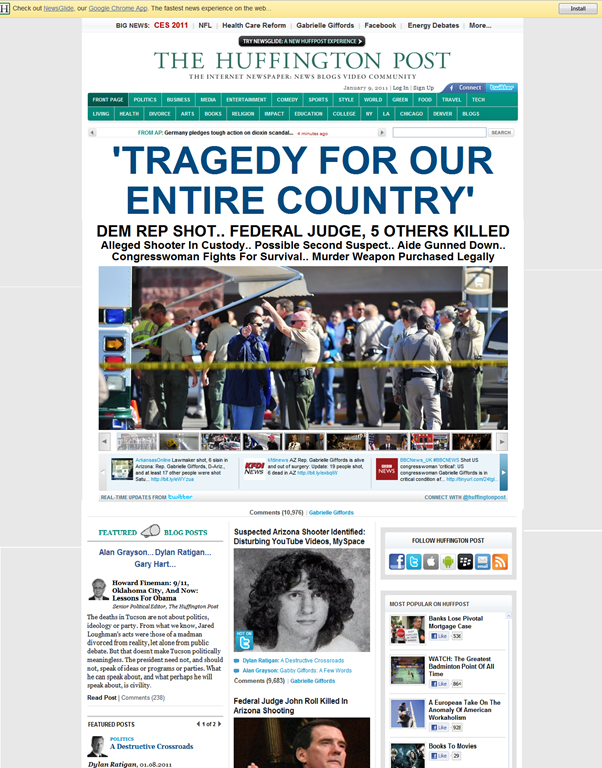 The Huffington Post is much more organized and feels “visually appealing, polished and professional” (Spritz Web Solutions), and has possibly gained its place because of the other content on its site, not just the political content, which suggests that the Drudge Report could actually be better than The Huffington Post in terms of political content, even if the website isn’t as attractive or as easy to use. The Drudge Report it does do its purpose well, which is to behave as a platform for readers to be directed to news stories from other website. With this in mind, perhaps over simplicity is actually its success rather than its downfall for this purpose. Last Summer my friends and I packed our bags and set off for the road trip of a lifetime around France! 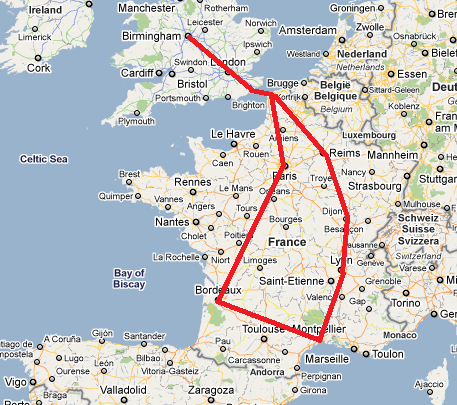 In just 11 days we visited Reims, Lyon, Montpellier, Bordeaux and the capital, Paris. This is a visual account of our experiences and adventures. Fed up of boring slideshows? Animoto Productions consists of techies and film/tv producers. Their first release is Animoto, a web application that automatically generates professionally produced videos using their own patent-pending technology and high-end motion design. 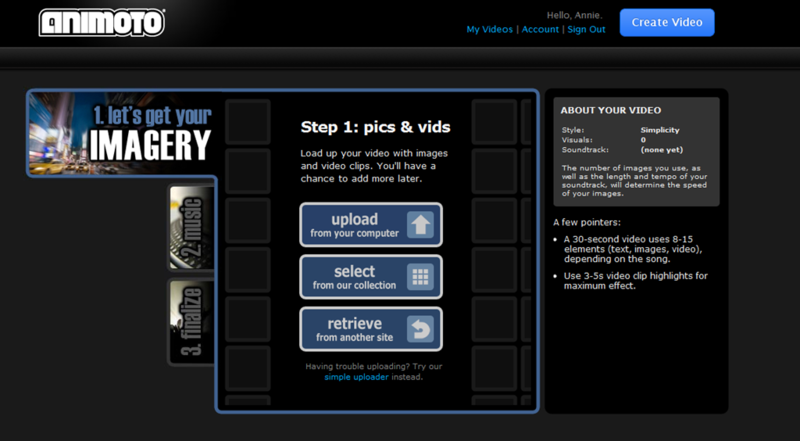 Each video is a fully customized orchestration of user-selected images and music. Produced on a widescreen format, Animoto videos have the visual energy of a music video and the emotional impact of a movie trailer, and is so simple to use! The heart of Animoto is its newly developed Cinematic Artificial Intelligence technology that thinks like an actual director and editor. It analyses and combines user-selected images, video clips and music with the same sophisticated post-production skills and techniques that are used in television &amp; film. Based in New York City with an office in San Francisco, the founders of Animoto include veterans of the entertainment industry and have produced shows for MTV, Comedy Central and ABC, have studied music in London, and have played in indie rock bands in Seattle. They continue to innovate in the field of creative artificial intelligence. They plan to acquire Google next year. Ellie Goulding was posting some very distressed tweets on the 3rd-4th December regarding some of the scenery from her music video for her latest single Your Song, originally by Elton John. At around 1:16-1:18 there are some close up shots of two carved logs. The bidding ended last night and the logs sold for £29.00 and £24.00. It is a lovely gesture yes, but also a very mysterious one as NSPCC has not actually issued any campaign like this on their website, Twitter or Facebook. Obviously this is their on-going campaign as they aim to end cruelty to all children in the UK. Here’s what the NSPCC are actually doing this Christmas. The NSPCC are sending out letters from Santa! 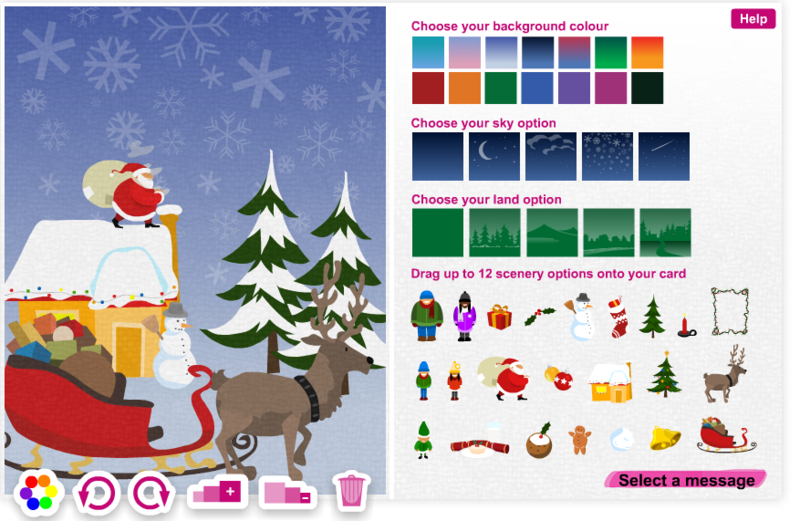 For a suggested donation of £5, you can make a child’s Christmas extra special. The letters are colourful and are uniquely personalised to best suit the child’s age range and gender. Every child in the same household will receive different letters. Last year the NSPCC sent out almost 150,000 letters all over the world. The last orders can be placed on Sunday 19th December. Ordering a letter also instantly places you into a prize draw with a chance to win a trip to Lapland for a family of four to meet Father Christmas! You can also donate to the NSPCC and receive a Christmas bauble, which you can personalise and give to a family or friend. The card comes with a colourful pop out Christmas bauble that they can hang on their tree to remind them of this special gift. The card explains that you have given them an extra special gift this Christmas – one that could change a child’s life – a donation to the NSPCC. Click Here to send a personalised Christmas eCard, the contemporary way to spread some festive cheer to your family and friends. Follow on Twitter, Youtube, Facebook or visit the NSPCC Website. What did you change your Facebook profile picture to? The writings of a film obsessed techno geek.